Rickenbacker 4003, Left-Handed Stereo Bass Guitar, Black "Jetglo" Finish Ever since they produced the world's first electric .. Ever since they produced the world's first electric guitar in 1932, Rickenbacker has been a main-stay in the world of modern music, with their basses being of particular note. From Paul McCartney, Chris Squire, Lemmy, Mike Rutherford, and even Mani (of Stone Roses fame), these excellently crafted instruments have been gracing a wide array of musical genres for more than 50 years, so it's only natural that here at PMT we stock some of their latest models. Featuring a bound neck-thru body, triangular fretboard inlays, dual trussrod system and Schaller Deluxe tuners, the Rickenbacker 4003 is a force to be reckoned with. This excellent bass guitar is widely regarded as one of the best in its class, and comes complete with that familiar Rickenbacker bass tone. The neck of the 4003 proves to be surprisingly playable, even at the upper registers, giving you the feel of a bass that you've been playing all of your life and that is versatile enough to cover pretty much any musical playstyle. 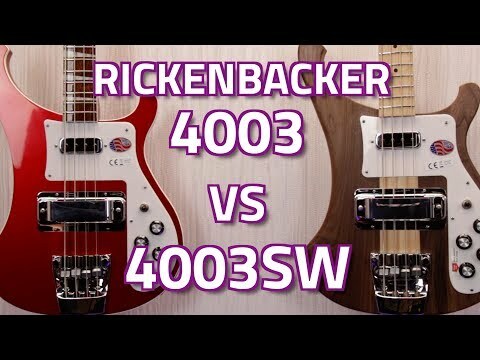 The basic tone of the 4003 is extremely well-balanced, providing you with a solid midrange and a touch of high-mid honk with a nice, fast attack. The sound is easily tamed with the use of either of the two tone controls though. The bridge pickup alone is the louder of the two, with a throaty, almost-but-not-quite harsh bark that can easily be softened through use of the tone control. The neck pickup focuses on plenty of warmth and fundamentals, producing a pleasing array of woody tones. The famous "Rick-O-Sound" comes from a stereo output effect that allows you to divide your pickup signals and send them to two different amps. This works especially well if you send the bridge pickup signal to a standard guitar amp and the neck pickup to a bass amp. The overall shape and construction of this bass has barely changed since it's first inception in 1979, even down to the extensive chrome hardware use. Anyone familiar with the basses of this era will instantly recognise the chrome pickup shield over the bridge position, and the unique scratchplate shape. Having played one of these myself, I can honestly say it feels like holding a piece of rock and roll history in your hands. If you order this bass before 3pm today you will qualify for our fast, free and reliable next-day delivery service (subject to stock levels, UK customers only). If you have any queries regarding our payment and delivery options, or even just the availability of this instrument, please feel free to contact our sales team directly on 0151 448 2089.